Zehner's Service Center is a full-service preventive maintenance and auto repairs center in the Akron, OH 44306 area, specializing in Alignment, Brakes, Car & Truck Care, Domestic Cars & Trucks, Electrical Services, Electronic Services, Engine & Transmission, Engine Maintenance, General Services, Heating and Cooling Services, Import Cars & Trucks, Miscellaneous Services, Tires, Towing, Transmission Services and Undercar Services since 1946. 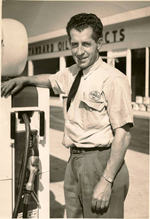 Zehner's Service Center was established in 1946 by Ernie Zehner Sr. Ernie built a new facility in 1958 at our current location. His goal was to have a more "modern" service center to better serve his customers. In 1978 Ernie Jr., Mark and Paul Zehner took over the business. Since then Zehners has grown from a three bay to thirteen bay facility using advanced automotive technology. We have 12 technicians with many years of experience to properly diagnose and repair your vehicle right the first time. We offer competitive pricing on all of your import/domestic and fleet service needs. Zehners offers complimentary shuttle service to your home or office. Our staff takes pride in our outstanding customer service, and looks forward to serving the needs of the Akron and surrounding areas! Our experts have the knowledge to service and repair even the most challenging auto problems on all makes and models of domestic and import vehicles. We use the latest technology to assess the situation and offer you alternatives. We guarantee all of our work and know you'll be happy with the outcome. Stop in or give us a call at 330-784-1041 to let us know how we can help you!